Congratulations to Dr. Xiao-Ying Yu, a chemist at Pacific Northwest National Laboratory, who was appointed to the prestigious Temporary Emergency Exposure Limit (TEEL) Advisory Group. Yu was selected by Jose Rafael Berrios, Director of the U.S. Department of Energy's (DOE) Office of Emergency Management and Policy, for her accomplishments in applied toxicology and development of the chemical mixture methodology (CMM). CMM is now the default DOE method for assessing hazardous health effects as a result of exposure to airborne chemical mixtures. The CMM, a companion product of the TEEL, is widely used for emergency preparedness and response and safety analysis decision making in the DOE complex, and worldwide. As a part of the Advisory Group, Yu will provide advice on the TEEL and the CMM development process and provide expertise, ideas, and resources to emergency management personnel to identify issues and priorities for emergency events. Emergency management programs are the last line of defense for protecting people, the environment, and national security. Yu earned her Ph.D. in physical chemistry at the University of Michigan and a B.S. in material sciences and engineering from Beijing Polytechnic University in China. She is a member of the American Vacuum Society, American Chemical Society, and the American Geophysical Union. 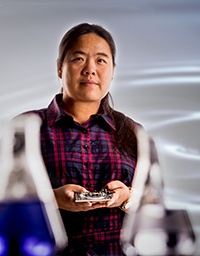 Yu and her team developed PNNL's System for Analysis at the Liquid Vacuum Interface (SALVI) allowing, for the first-time, powerful chemical imaging of liquids using vacuum instruments such as scanning electron microscopes and time-of-flight secondary mass spectrometry to study liquid surfaces and solid-liquid interfaces in real-time. She is also known for in situ characterization of atmospheric aerosols using advanced analytical techniques.